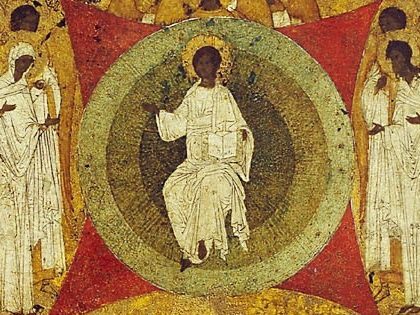 Mid-Sixteenth Century, Pskov School, Cathedral of the Annunciation, Kremlin (detail). In this detail God is depicted as resting on the seventh day, surrounded by the angelic host. Below him are depicted episodes from the biblical creation stories, including the creation and fall of man. On either side of him are icons of Christ as God’s angelic messenger and of Christ crucified. Much of the imagery is non-traditional or unorthodox. Ouspenky explains that in 1772 the Holy Synod of the Russian Church prohibited various forms of religious image, among them, those in which God is show as an elderly man, exhausted by his labors and now “reclining on cushions.” (Ouspensky, Theology of the Icon, vol. II, 416, n.16; cf. Bigham, Image of God the Father, 145. See also The Complete Collection of the Decisions of the Department of the Orthodox Confession, vol.2, 293–5 (in Russian). For similar images to figure 2 follow this link Wikimedia Commons.